Naturopathic doctors are educated and trained in accredited naturopathic medical colleges. They diagnose, prevent and treat acute and chronic illness, restore and establish optimal health by supporting the person’s inherent self-healing process. Rather than just suppressing symptoms, naturopathic doctors work to identify underlying causes of illness, and develop personalized treatment plans to address them. Their Therapeutic Order™, identifies the natural order in which all therapies should be applied to provide the greatest benefit with the least potential for damage. Remove Obstacles to Health. Health, the “natural state” of one’s body, is disturbed by obstacles that lead to disease. The first step in returning to health is to remove the entities that disturb health such as: poor diet, digestive disturbances, inappropriate and chronic stress levels, and individual disharmony. Naturopathic doctors construct a healthy regimen based on an individual’s “obstacles to health” to change and improve the terrain in which the disease developed. This allows additional therapeutics to have the most beneficial effects possible. Stimulate the Self-Healing Mechanisms. NDs use therapies to stimulate and strengthen the body’s innate self-healing and curative abilities. These therapies include modalities such as clinical nutrition, botanical medicines, constitutional hydrotherapy, homeopathy, and acupuncture. Strengthen Weakened Systems. Systems that need repair are addressed at this level of healing. Naturopathic doctors have an arsenal of therapeutics available to enhance specific tissues, organs or systems including: lifestyle interventions, dietary modifications, botanical medicine, orthomolecular therapy (use of substances that occur naturally in the body such as vitamins, amino acids, minerals), and homeopathy. Correct Structural Integrity. Physical modalities such as spinal manipulation, massage therapy, and craniosacral therapy are used to improve and maintain skeletal and musculature integrity. Use Natural Substances to Restore and Regenerate. Naturopathic medicine’s primary objective is to restore health, not to treat pathology. However, when a specific pathology must be addressed, NDs employ safe, effective, natural substances that do not add toxicity or additionally burden the already distressed body. Use Pharmacologic Substances to Halt Progressive Pathology. NDs are trained in pharmacology and how to use pharmaceutical drugs when necessary. If their state license permits, they can prescribe these agents themselves or if not, refer to a conventional medical colleague. Use High Force, Invasive Modalities: Surgery, Radiation, Chemotherapy. When life, limb, or function must be preserved, NDs refer patients to MDs who are expertly trained in these arenas. At the same time, NDs use complementary or supportive therapies to decrease side effects and increase the effectiveness of these invasive procedures. Naturopathic medical education curricula include certain areas of study not covered in conventional medical school. At the same time, aspiring naturopathic doctors receive training in the same biomedical and diagnostic sciences as MDs and osteopathic doctors (DOs). The result is a comprehensive, rigorous, and well-rounded scientific medical education that is both comparable and complementary to that of MDs and DOs. 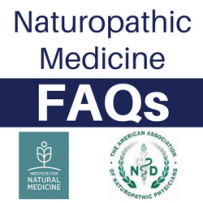 For more information on how naturopathic doctors are educated, trained, and licensed, see FAQ#1 in this service, available here and here on our website..
← How Are Naturopathic Doctors Educated, Trained, and Licensed?